Sandfire Resources advises that the new solar power facility at its DeGrussa copper-gold mine in Western Australia has achieved full generation capacity after successfully attaining key milestones during commissioning. The facility is currently generating approximately 7 megawatts (MW) of power, which is in line with seasonal expectations. 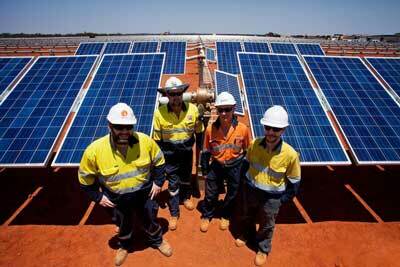 Solar generating output will ramp up during the summer months to achieve the full 10-MW functional capacity. The solar array covers a total area of more than 20 hectares at the site, which is located immediately adjacent to the DeGrussa underground mine and processing plant. Commissioning of the $40 million project commenced in March following installation of the last of the 34,080 solar photovoltaic (PV) panels. The project required electrical infrastructure to be installed including inverters to change the electric current from DC to AC, transformers, and other electrical accessories and control systems. Testing confirms that the plant can perform in accordance with contractual specifications and validates the power purchase agreements covering the facility. Continual testing will be completed in June to ensure it can maintain stable operations at 100% generation capacity. The innovative $40 million DeGrussa solar project is the largest integrated off-grid solar and battery storage facility in Australia and reportedly, in the world. The project comprises 34,080 solar PV panels with a single-axis tracking system mounted on 4,700 steel posts. This enables the panels to track the sun during the day, improving the plant’s overall performance. The panels are connected via an extensive network of low-voltage, high-voltage and communication cables to a 6-MW lithium-ion battery storage facility and the existing 19-MW diesel-fired power station at DeGrussa. The DeGrussa solar power project is owned by the leading French renewable energy firm Neoen, with juwi Renewable Energy responsible for the project development, EPC and O&M. The plant was constructed by national surveying and infrastructure construction company OTOC Ltd., with project financing provided by the Clean Energy Finance Corp. and recoupable grant funding support of $20.9 million from the Australian Renewable Energy Agency (ARENA). The solar facility has been integrated with the diesel-fired power station — owned and operated by Pacific Energy Ltd. subsidiary KPS — continuing to provide base-load power to the DeGrussa mine with sufficient minimum load to ensure it can respond quickly to meet the power requirements of the process plant and underground mine.